Friday’s post about words as sound shapes segued seamlessly into Exaudi’s Sunday afternoon Aldeburgh open session which featured two newly commissioned vocal works challenging that conceit of the information age that what cannot be articulated in words is beyond comprehension. First up was Matthew Shlomowitz’s a cappella Instrumental Music which investigates the relationship between the human voice and musical instruments – check out the composer’s website for samples of his compositions. Following Instrumental Music was Aaron Cassidy’s wordless tribute to Francis Bacon A painter of figures in rooms; this “takes the human voice apart and puts it (mostly) back together again” and could just be the Stimmung for the information age. Much credit goes to Exaudi and their director James Weeks for smashing the fossil and starting all over again, and to Aldeburgh Music for supporting their residency which was the prelude to a Wigmore Hall concert. But, as seen in my header photo, there was evidence in the Snape Maltings shop that Aldeburgh is struggling to find the balance between being in the commercial-intermediary complex, but not of it. Britten famously declared that “…the loudspeaker is the principal enemy of music… it is not part of true musical experience… music demands more from a listener than simply the possession of a tape-machine or a transistor radio”. What would he think of his image being touted to anyone possessing that twenty-first century equivalent of the transistor radio, the iPhone? And what would he think of Peter Grimes performed on his beloved Aldeburgh beach with loudspeakers reportedly substituting for a live orchestra? Was Britten right, and is the loudspeaker and its mobile media offspring part of the problem and not part of the solution? Is the centenary iPhone cover Aldeburgh’s answer to that best selling Salzburg delicacy Mozartkugel - Mozart balls? Are the keepers of Britten’s flame making a mistake by responding to Pears pressure? Header photo is (c) On An Overgrown Path 2012. My ticket for the Exaudi open session was purchased at the Aldeburgh box office. Report broken links, missing images and errors to - overgrownpath at hotmail dot co dot uk Also on Facebook and Twitter. 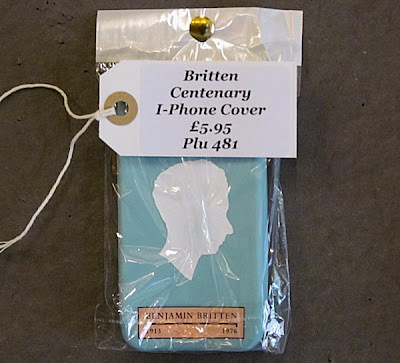 My research uncovers Wagner and Mahler iPhone covers but none for John Cage. Should we be thankful, or is it a missed opportunity? I should think John Cage would be a better candidate for a ringtone instead of a cover. "...the loudspeaker is the principal enemy of music… it is not part of true musical experience… "
I've seen this quoted far too often. It's either silly or snobbish ... or perhaps both. To take just one point that comes imediately to mind - a good percentage of my recordings are of music which I am most unlikely to ever have the chance to hear live. However, through the despised loudspeaker, I can experience and appreciate such music. Not only that, anyone's experience now of Britten the performer can only come via loudspeaker. I can't think of any logic by which these realities are bad things or not part of "true musical experience." "Anyone, anywhere, at any time can listen to the B minor Mass upon one condition only - that they possess a machine. No qualification is required of any sort - faith, virtue, education, experience, age. Music is now free for all. If I say the loudspeaker is the principal enemy of music, I don't mean that I am not grateful to it as a means of education or study, or as an evoker of memories. But it is not part of true musical experience. Regarded as such it is simply a substitute, and dangerous because deluding. Music demands more from a listener than simply the possession of a tape-machine or a transistor radio. It demands some preparation, some effort, a journey to a special place, saving up for a ticket, some homework on the programme perhaps, some clarification of the ears and sharpening of the instincts. It demands as much effort on the listener's part as the other two corners of the triangle, this holy triangle of composer, performer and listener." Yes, I'd come across the complete quote several times, Pliable, and I don't think it changes my opinion. Most of Britten's purported demands can be (and I suspect usually are) ignored by most listeners. I don't think I'm being cynical to suggest that many (most?) listeners satisfy only two - they are physically present and they have a ticket. And the complete quote raises another aspect - "It demands as much effort on the listener's part as the other two corners of the triangle, this holy triangle of composer, performer and listener." This makes no sense (that's perhaps the kindest wa to put it). The award speech from which this is taken is fascinating, but the approach Britten takes easily leads to overstatement, and it seems to me that Britten falls squarely into the trap. Scott, I think it best if we amicably agree to differ on whether Britten's Aspen Award speech makes sense..